as Pastor Edwards preaches a sermonic message that is biblical, exegetical and inspirational. Worship, Fellowship, and Spiritual Nourishment is essential to growing and maturing in Christ and the Word of God. says, "So then faith comes by hearing, and hearing by the word of God." Jesus said, "But the hour is coming, and now is, when the true worshipers will worship the Father in spirit and truth; for the Father is seeking such to worship Him. 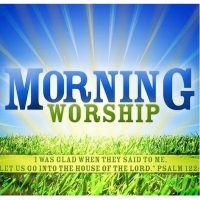 The Nursery Building is open during the 10:45am Worship Service for the little infants and preschoolers. The Tabernacle Nursery staff is ready to love on your little one while you enjoy your time in worship.